Although essentially solo performers, Alison and Geordie have developed a joint repertoire based on a fine sense of personal harmony. "A stunning display of how powerful tradition bearers can be presenting the experiences of people and the rich mythology of Scotland with a skill and unadorned passion for their cause." On 1st December 2018, Alison and Geordie attended the MG ALBA Scots Trad Music Awards 2018 in Perth where they were both inducted individually into the Hall of Fame. Look out for Ravens Reel, a new publication of 40 songs written by Geordie. Released in December 2018, it is available directly for £10.50 inc P+P. 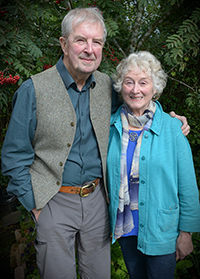 Alison's close working relationship with Elizabeth Stewart, culminated in the publication in 2012 of 'Up Yon Wide and Lonely Glen'. 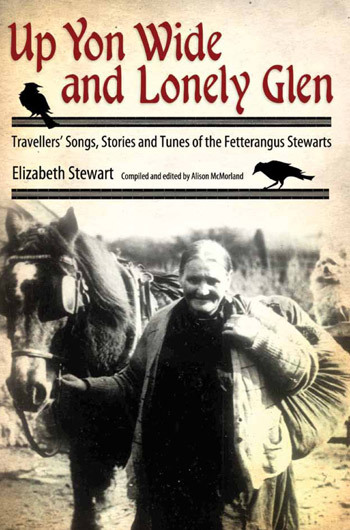 "This is a woman-to-woman book by Elizabeth Stewart, a remarkable Traveller singer and storyteller and her family's rich musical heritage, created in collaboration with the exceptional singer and folklorist Alison McMorland. This proves to be the perfect combination. It is a labour of love and friendship enriched and validated by their communal knowledge." Visitors to Historic Scotland's Smailholm Tower (by St Boswells) will hear Geordie and Alison's ballad soundtrack and story of Sir Walter Scott, with narration by Billy Riddoch. Alison was born in Renfrewshire into a musical family. Since then she has enjoyed a long involvement in traditional music on various levels: singer, collector, broadcaster, author, founding song tutor on the Scottish Music Course at the Royal Conservatoire of Scotland Glasgow. Alison came to wider public notice in the mid 1970s through her immensely popular children�s album and book The Funny Family and working in BBC Children�s Radio. Under the inspirational guidance of the late Hamish Henderson in learning directly from - and recording songs - by traditional singers such as the Border shepherd Willie Scott and Lucy Stewart of Fetterangus he was to say of her 'Alison stands out as one of the principal modern interpreters of a ballad singing tradition... uniting scrupulous traditional fidelity with versatile creative and resourceful artistry'. In 2001 she recorded a solo album �Cloudberry Day� followed by and in partnership with Geordie McIntyre, Rowan in the Rock, and Ballad Tree, classic Scots Ballads in the Tradition Bearers series produced by Living Tradition. Their highly acclaimed White Wings album was most recently followed by Where Ravens Reel. Alison particularly enjoys working with young singers and introducing them to the rich Scots song tradition. A Glaswegian of Highland and Irish descent, Geordie's lifetime involvement in song, ballad and poetry is reflected in his singing, collecting and songwriting. His early years as a radio and television technician and later as a Modern Studies teacher, coupled to his passion for the outdoors have, in diverse ways, fueled and complemented his central interest in folk music; as a concert and folk club organiser, author and record producer. For many years Geordie has collected songs, working with Hamish Henderson, Helen Fullerton and A.L. Lloyd. He has an interest that combines hearing the songs in the community and researching their background. He has written song notes for numerous recordings along with album reviews. His first-hand experience has added greatly to his articles on the legacy of Hamish Henderson, edited by the late Paddy Bort, in the Gracenote Publications. Geordie has sung at clubs and festivals in most corners of Britain and Ireland as well as Italy and the USA.